The smoke alarms in my apartment building are both ridiculously sensitive and ridiculously loud. They regularly go off even when there’s no smoke, and I often have to scramble up on top of a chair to reset them because a pot of boiling water is producing steam. If I stand in the hallway for a few minutes just before dinner time, I can hear them go off in the different apartments, followed by my neighbors’ strings of profanity and rushed footsteps. This got me wondering: How do these things work? 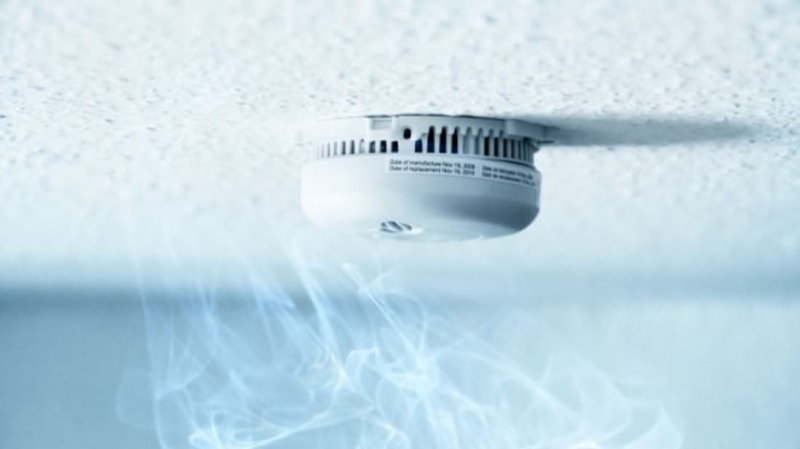 There are two main types of smoke alarms used in homes: ionization detectors and photoelectric detectors. Inside the ionization ones there’s an ionization chamber with two plates and a source of ionizing radiation. The alarm’s battery sends a voltage to the plates, charging one positive and the other negative. The radiation source, a small amount (around 1/5000th of a gram) of an isotope called Americium-241, decays and emits alpha particles (subatomic particles made of two protons and two neutrons) at a reliable, constant rate. As the particles travel through the chamber, they ionize, or knock an electron from, the oxygen and nitrogen atoms in the air that passes through the chamber. The newly free electrons, which have a negative charge, are attracted to the positively charged plate, and the now-positively charged atoms are attracted to the negative plate. This maintains a small but constant current between the two plates. When smoke enters the chamber, it disrupts this little dance of ionization and lowers or kills the current between the plates, triggering the alarm. Now, if the idea of radioactive isotopes hanging from the ceilings in your home alarms you a little, and quick death by fire sounds more attractive than slow death by radiation, let me put your mind at ease. Alpha particles have very little penetrative power. They can’t get through the plastic of the detector, and if they did escape, they can’t travel very far in regular air. Because of the small amount of Americium in there, and the design of the detector, there’s no health hazard unless you monkey with the chamber and directly expose yourself to the particles (that is, inhale or ingest them). The two big drawbacks to ionization detectors are that the radioactive isotope requires proper disposal of old detectors so that they don’t pose a hazard, and that their design is very sensitive (to detect hot, fast fires that produce very little smoke). This means, as I can attest, that they’re prone to false alarms caused by dust and steam and other vapors. The other common kind of detector, a photoelectric detector, contains a light-emitting diode that sends a beam of light across the top of a T-shaped chamber. At the base of the T is a photocell that detects light. When smoke enters the chamber, the light hits it, gets scattered into the base of the T and strikes the photocell. When a certain amount of light hits the cell, it triggers an electrical current that sets the alarm off. These detectors are not as sensitive as the ionization ones and are designed to detect slow, smoldering, smokier fires.